"The First Day of Someone Else&apos;s Life," by John Schoffstall [bio] (edited by C.C. 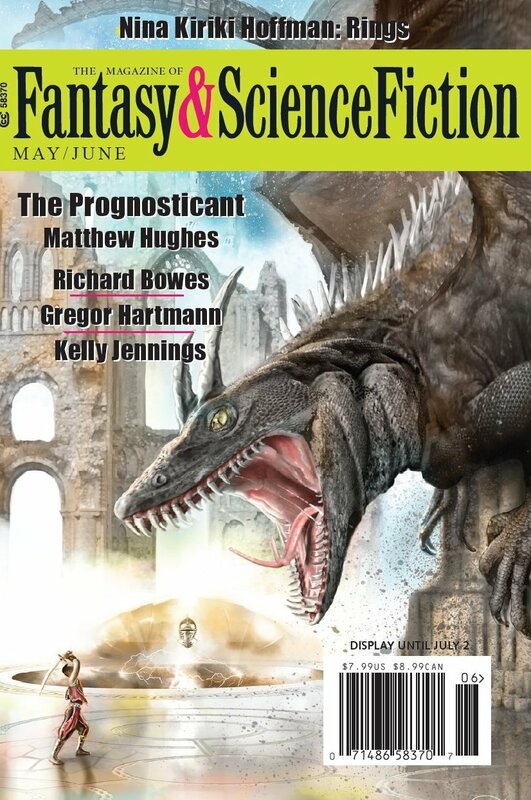 Finlay), appeared in Magazine of Fantasy & Science Fiction issue 05-06|17, published on May 1, 2017 by Spilogale Inc. Pro: There’s a good bit of thrills, chills, and excitement, and it’s satisfying (if horrible) to finally learn the truth. Con: Neither Mook nor Lisa is a terribly sympathetic character. Early on, Mook seems pretty stupid to trust her. It’s hard to see why he doesn’t seek professional help at once. The ending is a bit confusing. Why does she call him "Mook?" It’s not clear who the narrator is in the final section. It’s been Lisa up to that point, but it’s clearly not her because she's in the scene. The world-building is a bit overwhelming at first. It makes this seem like a fragment of something longer. I assume Lisa calls him Mook because he said she looked like a mermaid. And he thought he was Mook when he dreamed of her as a mermaid. The final narrator seems to be Will/Mook in second person. It is confusing coming after most of the story is from Lisa in first person addressing Mook as "you."